Lightning Powder 3-5180 Xtend & Climb Ladder FREE SHIPPING! The Xtend & Climb Ladder by Lightning Powder Company, Inc., fully retractable ladder system that you can easily take wherever you need it most. 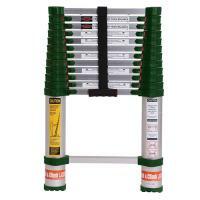 Extending to 12 1/2 feet, you can store this sturdy ladder almost anywhere when its compacted down to 32 1/4 inches tall. Forget an awkward standard ladder carrying experience or needing a second pair of hands. This is a breeze to carry thanks to an integrated handle and safe to use due to its proprietary no-pinch closure system. Crafted with aerospace engineered alloy, this has been given an anodized finished for a nice, clean look. It also has non-slip end caps for added safety. ©2002-2019 CopsPlus.com: Lightning Powder 3-5180 Xtend & Climb Ladder FREE SHIPPING!